Rachel Anne Ridge is a speaker, artist, and writer. Her journey into blogging started at HomeSanctuary.com in 2006 as a means of sharing daily encouragement with other women. For two years, she also wrote for and managed Priscilla Shirer’s blog, GoingBeyond.com. In 1999, after tole-painting Christmas gifts, Rachel began creating murals and faux finishes in the Dallas Fort Worth area. After her homegrown business took off, her husband Tom joined her, and together they expanded it into a large-scale corporate art, graphic design, way-finding, and custom artwork company. 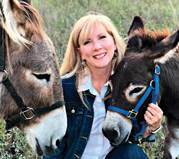 Rachel’s book Flash, The Homeless Donkey Who Taught Me About Life, Faith, and Second Chances was published in 2015 and has been optioned by PureFlix Studios for a movie. Rachel lives in Texas with her husband, Tom, and two donkeys. They have three grown children and five grandchildren. God often sends us down an unexpected path in life—one that ultimately blesses us more than our original plan. Have you ever experienced such a “Divine Detour”? One of my biggest detours happened when a stray donkey arrived on my driveway! I didn’t have the time or patience to put into caring for a five-hundred pound “opinionated” donkey and would have happily sent him packing. However, our whole family fell in love with him, and when his overnight stay became a permanent situation, we named him Flash. I didn’t know he would spark a detour at the time, but he began to be my own personal object lesson in the pasture and became one of my biggest blessings. What started you on your writing and speaking journey? I began blogging in 2006, as a way to share my ideas for creating a sense of sanctuary at home with other women. I didn’t have a goal of writing books and speaking, I just focused on creating good content that people enjoyed. I’m still amazed at how committing to doing that first thing (blogging) led to so many other opportunities. Let’s talk about your new book Walking with Henry (Tyndale Momentum, March 2019). Please tell us about it. 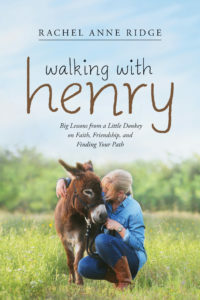 Walking with Henry is about how a miniature rescue donkey, who was brought in to be a companion for Flash, ended up being my companion as I journeyed through loss, regrets, life changes, and deep questions about my faith. When Henry arrived, he was so afraid to walk with me on a lead rope that he would turn and walk backwards! I saw myself reflected in this sweet donkey—afraid to move forward yet willing to take small steps, even if I was facing the wrong direction! As an animal lover, I relate to how much we can learn from them. I understand that Henry also helped teach you about prayer. Henry arrived at a time when I felt stuck in my prayer life. I didn’t know what to do, except try something new. I decided to do “prayer walks” in the pasture, with Henry by my side. Now, walking with a donkey is slow! There are many stops along the way, which gave me a chance to take in nature and consider my Creator. From this donkey, I learned that it is important to slow down, to be present in the moment, and that prayer can be as simple as meditating on a written prayer when you don’t have your own words. I’m still amazed at how committing to doing that first thing (blogging) led to so many other opportunities. You’re a mother of three and a grandmother to five. What one important life lesson do you most hope your grandkids will learn from the book? I hope that they will know that God is big enough for any questions they might have, and that His love is always present—even when they can’t feel or sense it. I want them to have honest faith that isn’t afraid of not having all the answers. Even if they don’t know where their own journey will take them, they can trust the One who is leading them. Thanks, Rachel! It’s nice to have you as a guest at Divine Detour. For more information about Rachel, visit her website and/or on Facebook or Twitter.